I am back after a mini-break and as I always tell Summer can be busy. I feel bad when I ignore my Blog for a few weeks. I am trying to get my grove back on blogging. Here is an easy recipe to begin. 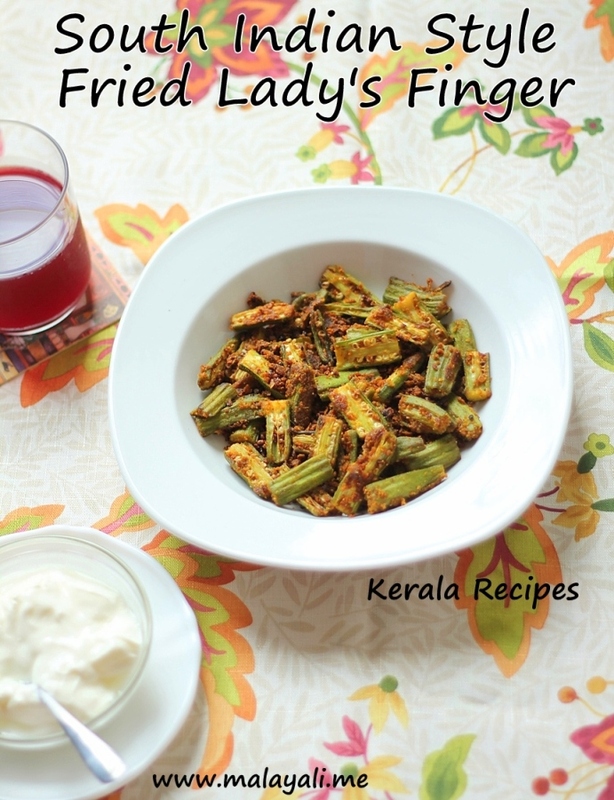 Lady’s Finger or Okra (known as Bhindi in Hindi and Vendakka in Malayalam) is a yummy vegetable but preparing it can be quite messy. It is sticky and needs extra care while cooking. Always use tender Okra for cooking as the more mature ones will be woody and fibrous. Rice Flour removes some of the sticky goo from the Okra and deep frying makes it crispy. I have stir fried the Lady’s Finger in this recipe but if you want a good crunch, feel free to deep fry it. The deep fried ones will disappear from your table in no time. Wash the okra and trim the ends. Wipe away excess moisture using paper towels. Slice each Okra along its length into two halves and then dice it into 1″ long pieces. 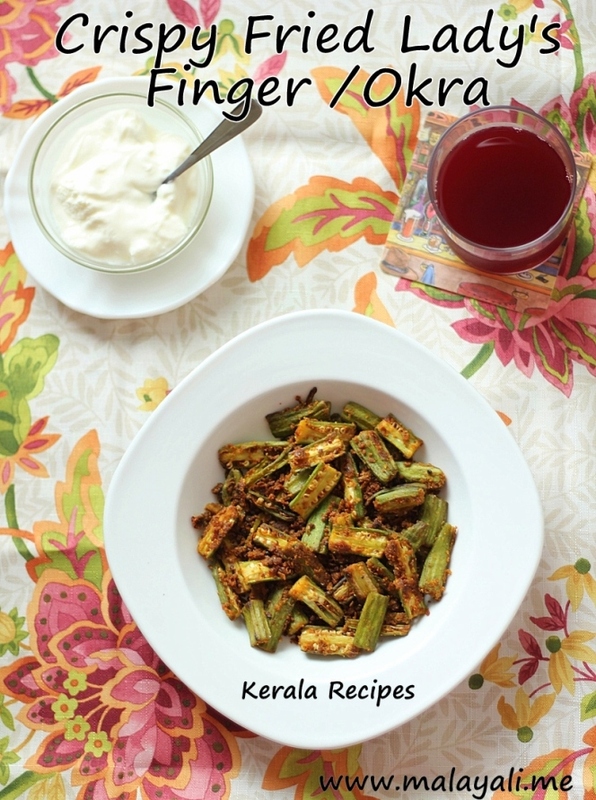 Marinate the Okra with Turmeric Powder, Red Chilly Powder, Sambar Powder, Salt and Rice Flour. Keep it aside for 10 minutes. Heat oil in a wide pan or skillet and add the okra pieces to the pan in a single layer. Allow it to cook for a 2-3 minutes on medium-high heat so that it browns a bit. Gently stir fry for another 6-7 minutes. Remove from heat when it becomes crispy. Serve immediately with rice. If you wish, you may deep fry the Lady’s finger for 3-4 minutes and it will be really crispy. Kerala style ladies finger looks yumm. lovely recipe i will make it soon!!!! Made this today and it tasted delicious.